Find out the history, mission, and vision of our company. We provide premium closed captioning, transcription, audio description, and subtitling solutions at very competitive prices. Our goal is to simplify the process by providing a user-friendly account system, fast turnaround, flexible API’s, and integrations with a multitude of video players, platforms, and lecture capture systems. We create closed captions and subtitles in many different formats and languages. We also develop video search plugins and a range of tools that save time and cut costs. Our commitment to innovation has led to 7 patents (granted and pending)–all of which focus on making the captioning, subtitling, and transcription process more efficient and less expensive. 3Play Media was founded in 2007 by four MIT graduate students researching affordable ways to make video accessible through innovative technology. Drawing on research from the MIT Spoken Language Systems Group, we developed a more efficient captioning and transcription process that combines automatic speech recognition with human editing cleanup. Our services and products are used by more than 2,500 universities, companies, and government agencies across a wide range of industries. 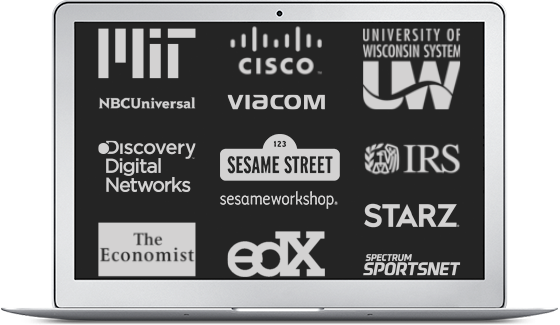 A few of our customers are Procter & Gamble, Time Warner Cable, MIT, Autodesk, the IRS, and the University of Wisconsin. Our captioning, transcription, and subtitling solutions increase the value of online video by making it accessible, usable, searchable, and SEO-friendly. Customers benefit in different ways. Educational institutions and government agencies benefit by complying with accessibility laws; media & entertainment producers and distributors benefit by complying with FCC captioning rules; online video publishers benefit from better SEO, searchability, and user engagement; market researchers and video producers gain productivity through video search, clipping, and editing tools. As a company, we love captions and the communities they serve. Through our Faces Behind the Screen project, we’re telling the stories of the d/Deaf and hard of hearing community, who benefit from captions every day. One of the great things about captions is that they benefit so many people – from the d/Deaf and hard of hearing, to people who know English as a second language, to people with learning disabilities, to everyday viewers in sound-sensitive environments. We made this video to show all the ways in which captions can make your videos better!